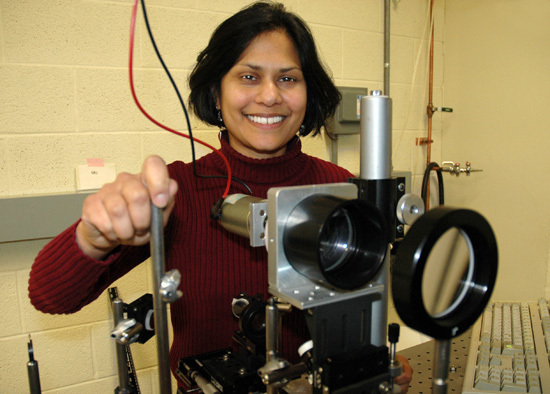 Ishita Mukerji, chair and associate professor of molecular biology and biochemistry, uses a UV resonance Raman spectrometer in her research at Wesleyan. Mukerji recently attended a conference in California, judging presentations on biomedical sciences. Encouraging underrepresented minority students to pursue advanced training in the biomedical and behavioral sciences was the purpose of a recent conference in Anaheim, Calif. And the chair of Wesleyans Molecular Biology and Biochemistry Department was there to help guide these students down that path. Ishita Mukerji, chair and associate professor of molecular biology and biochemistry, was among 220 scientists around the country who attended the 2006 Annual Biomedical Research Conference for Minority Students (ABRCMS), held Nov. 8-11. The scientists volunteered their time and energy in judging the 1,048 poster presentations and 72 oral presentations. Now in its seventh year, ABRCMS is the largest professional conference for biomedical and behavioral students. Over 2,500 people attended the 2006 conference including 1,633 students, 421 faculty and program directors and 418 exhibitors. ABRCMS is supported by a grant from the National Institute of General Medical Sciences and managed by the American Society for Microbiology. By volunteering as a judge, Mukerji served in one of the most important roles at the conference, explains Ronica Rodela, spokesperson for the ABRCMS. The judge’s role in providing constructive feedback to student presenters positively enhances the professional development and advancement of students in their scientific research, Rodela says. These presentations were given by undergraduate, graduate, post-baccalaureate students as well as postdoctoral scientists in nine sub-disciplines in the biomedical and behavioral sciences. The top 120 undergraduates received monetary awards of $250 for their outstanding research. Mukerji says some of the research she judged was comparable to the research being done by Wesleyan undergraduates. On the other hand, there is a wide range of science presented at the conference, and some of the students are coming from two-year institutions that don’t have a lot of resources for doing science. Mukerji is currently the chairperson of the Minority Affairs Committee for the Biophysical Society. For their annual meeting in March, she has arranged a panel discussion on “Recruitment, Retention and Mentoring of Under-represented Students.” Featured panelists will be representatives from MentorNet and Venture Scholars. Both of these organizations are committed to increasing diversity at all levels in the sciences. For more information on the conference, visit www.abrcms.org. The 2007 ABRCMS is scheduled for Nov. 7-10 in Austin, Texas.